The MCF5407 is manufactured in a 0.22-µ CMOS process with quad-layer-metal routing technology. This process combines the high performance and low power needed for embedded system applications. Inputs are 3.3-V tolerant; outputs are CMOS or open-drain CMOS with outputs operating from VDD + 0.5 V to GND - 0.5 V, with guaranteed TTL-level specifications. Harvard architecture memory system with 16-Kbyte instruction cache and 8-Kbyte data cache. DRAM controller for synchronous and asynchronous DRAM. Two UARTs, one that supports synchronous operations. It is used in commercial & industrial purposes in embedded system. 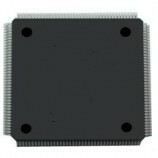 It is used in embedded system microprocessor based projects. Multiple DIY and industrial projects. Also Searched as: mcf5407 datasheet, Microprocessor mcf5407, mcf5407 circuit, mcf5407 datenblatt, testability features the mcf5407, paper the mcf5407, mcf5307.